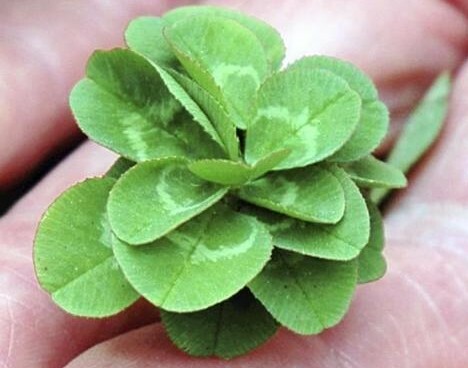 A 21-leaf clover discovered on June 3 by Iwate prefecture farmer Shigeo Obara has shattered the Guinness world record for most leaves on a clover stem (Trifolium repens L.). The current official record is held by an 18-leaf clover that Obara found in his garden in May 2002. The record-breaking clover's 21 leaves each measure about 1 centimeter long and overlap each other like rose petals on a 3-centimeter stem. Obara, a former food crop researcher, has been conducting independent research on clovers in his garden for over 50 years. He first became interested in clover mutations after discovering an unusual patch of 4-leaf clovers in 1951. Since then, Obara has been crossbreeding the plants in his garden to research the genes associated with leaf count, color, pattern and size. Obara plans to file a new application with Guinness, although he is considering waiting a while. "We are likely to find clovers with more leaves," he says. Last month, a family member claimed to have found a 27-leaf clover, but the discovery was not confirmed. While some say that 4-leaf clovers symbolize happiness, 5-leaf clovers symbolize wealth and 6-leaf clovers symbolize fame, it is unclear what 21-leaf clovers symbolize. Amazing. love it. is that radioactive? So how much luck is that meant to bring you i wonder?! A 21-leaf clover symbolizes someone with far too much time on their hands, that's what. I believe a 21-leaf clover signifies quirkiness, but I'm not saying ryuchan is wrong. I find them everyday, so you do not have a right to say that there are none. well I just started finding 4 leaf clovers at a patch near my bus stop - 14 of them - and one 5 leaf lover - ive also found 1 four leaf and 1 6 leaf when I was a kid - I wonder how many more i can find?? I am only 12 and i have right now 364 pressed 4-leaf clovers. I also have 87 5-leaf clovers and 1 6-leaf clover. I made a book to put them all in to last and many people don't belive my incredible luck. i have only been collecting for 1 year and i already have found many. i also wonder how many more i can find as the years pass. I believe you. I found an area at my parents house that produces large amounts of 4 leaf clovers. I've never visited it without coming back with a couple dozen. Never found >4 leaf clovers. Wow... I just found a patch by where we put our garbage and there are more than six four-leaved, two five-leaved and one six-leaved. I think if you grow clover in compost it may be more likely to produce mutations. A 21 leaved clover is crazy though. you gotta believe and just scan for the one that looks different. Most of the time they are standing up looking at you. that is so fake. I can do that with a mint plant if I were willing to take the time. first clue! he used to work in food crop research. Bet he knows how to mess with plants to make them different. Trust only have of what you see and nothing you hear. WHOS TEAM R U GUYS/GIRS ON?? FOR TWILIGHT. TEAM EDWARD (YEAHH GO EDWARD!!) OR TEAM JACOB?? I found 4 4 leaf clovers before and i am not lieing! I am going to find more. I found 3 when i was helping my mom pick weeds and found the last one in my backyard. It was just 5 minutes ago! i went on the computer to see if there was other covers. This one is not fake and not saying it is fake! I know are not going to belevie me, but i do not care. I have been finding four leaf clovers for years. I have thousands dried and pressed, and make "art" with them. This 21 leaf specimen does not count in my book because he is manipulating them. All my clovers were found growing on their own in nature. I FOUND A 5 LEAF CLOVER IN MY GRANDMAS BACK YARD AND IM ONLY ELEVEN YRS OLD...AND I FOUND 8 FOUR LEAF CLOVERS MY WHOLE LIFE... SOMEBODY PLEASE TELL ME IF A 5 LEAF CLOVER IS REAL BECAUSE I DONT KNOW!!!!!!!!!!!!!!!!!!!!!!!!!!!!!!!!!!!!!!!!! Its totally real. I have found about fifteen four-leaved two five-leaved and one six-leaved. I wasn't even looking. Congrats on finding so many at a young age. wow. i have never found a 4+ leaf clover before and i'm eleven, now that i have read all your comments, i'm gonna try to find some. wish me luck! First off, find them in the WILD NATURE, not in a damn clover-brewery like this guy. thats still very rare, but he was manipulating them. I found 3 5 leaf clovers this morning, and seven more 4 leafs. all within 3 mins. I dont see how its so hard for some people to find them, since i have found MANY in my time. Most i have ever found was a 7 leaf clover. i have found a few 6 leags, and many 5 and four leaves. Needs to be WHITE CLOVER (TRIFOLIUM REPENS) to be true in rarity and 'luck'. Others dont count, to my knowledge anyway. I wont say that i have just stumbled upon all my findings, because i have purposely searched before to see how many i could find. but now its almost a 'curse', any time i glance down and see clover, i almost always find a four leaf clover. How would you breed clovers? Could you just have a bunch of clover and snip the ones which were 3 leaved, or would that kill the four leaf ones as well. Or would you have to actually cross pollinate them? Just found out they existed a couple of days ago when a friend showed me one (could have been fake, I didn't get a good enough look) and found a patch of about 20 clovers in my garden of which 2 were 4 leaved and one was 5 leaved. Since then I've been looking at the ground at patches of well trod clover. I don't recall ever finding a clover with more than 3 leaves. Then again, i've lived in new mexico for the last 9 years or so, where even 3 leaf clovers are rare. They simply don't grow out here. I have 24 clovers taped up on my door. all of them have either 4, 5, or 6 leaves. The most I have ever found in one day is 7 clovers. I beleive that is a real clover but he obviously bred them to give more clovers the mutated gene and get more extra leaves. Thats cheating. we have been collecting for about 5 months now and we have both, together, found about 900 four leaf clovers. all in the wild. we have also picked about 300 five leaves, 100 six leaves and about 4 seven leaves. we were wanting to go for the world record but realized the number is so large, 111,060. so we decided to go and try for the five leaf clovers. does anyone know the record? we can't find it anywhere online. Hi i found a 35 leafed clover in my hood. i gave it to my soul mate who loves leafs and atmo im so excited. man thats awesome iv never seen anything like it in my whole life!!!!! I think the mutations must have to do with something that is in poop. Because just today I found 15 four leafed, 1 five leafed, and 1 seven leafed clover! And they where in a spot my dog likes to poop. P.S. I planted then patch with the seven leafed clover. I thought we had collected all the types of clover until my son brought home an 8 today from school. We have found thousands of 4's hundreds of fives, 25 x 6's, 2 x 7's and now an 8. We also found 143 4 leaf clovers 15 five leaf clovers and one 6 leaf clover in 57 mins yesterday between 3 of us. What a lucky day. The quest for the nine has already begun. what else can make me lucky? i have never been lucky in my life. 21 Leaf clovers symbolize the excess of society. You all who are saying it doesn't count make me laugh. You think any animals or plants that hold world records, aside from some dogs maybe, weren't bred to be that way? And dare I say if this clover doesn't count, those dogs don't count in the same way. Yorkie's were bred to be able to go into holes, hound dogs were bred to be trackers, etc. It's not about the most extravagant natural things, it's about the most extravagant things, and 21 leaves is far more extravagant than 4, 5, 6, .. , 10. Oh, and, the same guy has since discovered a 56-leaf clover. i have discovered many different kinds of clovers like dozens of four leaf clovers and at least 50 five leafed clovers. right now i have 19 six leaf clovers and incredibly two seven leaf clovers i found one day apart. I also found a eight leaf clover and a ten leaf clover and got into the news paper for it. i am collecting so many clovers right now that i cannot keep track of the dozens of drying clovers. the biggest four leaf clover i have ever found is about a inch and a half wide and an inch tall. i have found a few four and five leafed clovers and two six leaf clovers. You probably don't believe me but I found a 37 leaf clover at my school yesterday. I was walking around trying to find a four leaf clover and a person who works there told me a good place to look and I looked there and first I saw only three leaf clovers. Then I looked around and I spotted something that looked different than all the other clovers. I move the stem around and I see that there are three leaves on some sides two on some sides and one on some sides. I finally got home after a lot of things I did that day and it was too withered to keep it and count it so I tear the leaves off so Me and my Mom could count them. After we passed 29 what I thought I had before because my Mom miscounted I was excited. When we were done we counted 37 leaves. i have been looking for a ten leaf clover and i keep on finding a four leaf clover.i have been riding whith my brother to clover patches and my brother finds five and six leaf clovers and i find four leaf clovers. This is utterly stupid since he more then likely engineered this clover to produce this many leaves. When I was a kid I found lots of 4, 5, and 6 leaved clovers in my yard. I also found a 7, 9, and 11 leaved clover. Never realized it was that unusual. I pressed them and put them in a photo album, guess I should get it out of the attic and see if they're still intact! But I agree, breeding clovers to make them produce more leaves on one stem is cheating!!! There's no way some of you people found 10 or 11-leafed clovers. Give me a break. that the 'toilet stuff' goes, I found a 6leaf clover. WAY TO GO ON THE 21 LEAF!!!!!!!!!! I have been finding 4 leaf clovers for years and I still look for them now. I found thousands of them 4-5and 6 leaves uncountable. I found many with 7 leaves and 2 or 3 8 leaf clovers. on july 13 1982 I found a 20 leaf clover in Lincoln woods state park in Rhode Island. I sent it to the Guinnes book of world records but could not get it reconized as a record.the record then was 14 but 20 is a far cry of the new record of 56. I would like to meet the man who found who found that one! maybe theres a 700 leaf clover out there waiting to be found! Richard Rezendes. Providence Rhode Island. I’ll see your 4 and raise you 17 « Horseman, Pass By! Rue The Day! » Blog Archive » Does the Luck Cancel Out After About 20? BagOfNothing.com » Very Lucky Cloved?